If a deposited check is returned by the bank, record an NSF for the donor. This can be done by entering a donation with a negative amount. Click on "Donations" and then click on "New". Enter the date of the NSF per bank statement in both date fields. Enter the Amount as a negative and then choose the Designation per the returned check. If there is no specific designation on the returned check or envelope, then choose "General" as the designation. Choose "Check" for the payment method. Write "NSF" and the check number, per the returned check, in the "Check Number" field. Enter the NSF date used above. 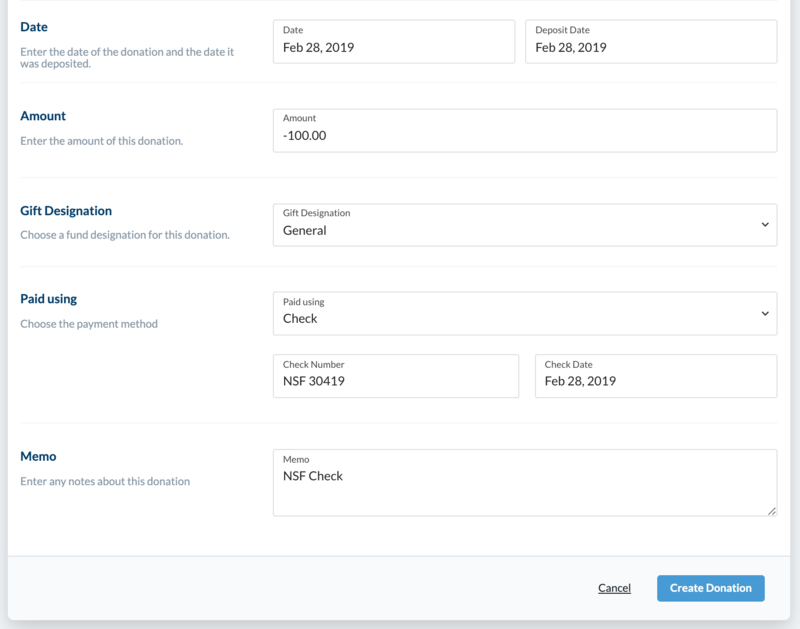 Use the "Memo" box to enter any additional information you might have about the NSF and then click "Create Donation".